DeviantArt artist Andrew 'AndyDaRoo' McGee places all the colossi in a single image, drawn to scale. There are some pieces of fanart that just make your jaw drop. Artist Andrew McGee has beautifully illustrated the overwhelming scale of the monsters in Shadow of the Colossus. Combining all of the 16 colossi in a single image, the work shows the wide range of sizes of these creatures. 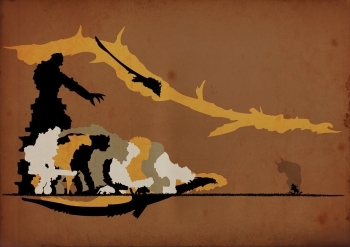 The image makes clear the differences in scale between colossi, and puts their size in perspective with Wander and his horse, Argo, placed on the right. The colors even recall the desaturated colors and the darkness of the game. McGee has posted some other minimalist pieces on his page, including images of the gravity gun and portal guns from Half Life and Portal. You can check out the full size image of the colossi, and McGee's other work, on his DeviantArt page. Shadow of the Colossus developed a devoted following its release for PS2 in 2005. An HD version came to PS3 in 2011. The game follows the long and lonely journey of Wander as he aims to take down the colossi and resurrect a girl named Mono. Some dedicated players, known as secret seekers, have spent years scouring the game for its hidden Easter Eggs. One theory was that a hidden 17th colossus existed in the game, somewhere in the Forbidden Lands. Shadow of the Colossus is currently available free to PlayStation Plus members on the PS3.